Treponema succinifaciens Cwyk and Canale-Parola 1981 is of interest because this strictly anaerobic, apathogenic member of the genus Treponema oxidizes carbohydrates and couples the Embden-Meyerhof pathway via activity of a pyruvate-formate lyase to the production of acetyl-coenzyme A and formate. This feature separates this species from most other anaerobic spirochetes. The genome of T. succinifaciens 6091T is only the second completed and published type strain genome from the genus Treponema in the family Spirochaetaceae. The 2,897,425 bp long genome with one plasmid harbors 2,723 protein-coding and 63 RNA genes and is a part of the Genomic Encyclopedia of Bacteria and Archaea project. Strain 6091T (= DSM 2489 = ATCC 33096 = JCM 13475) is the type strain of Treponema succinifaciens [1,2]. Currently, there are 25 species placed in the genus Treponema . The species epithet is derived from the Latin noun acidum succinicum meaning succinic acid and the Latin verb facio meaning to make, produce, referring to the succinic acid-producing property of the species . T. succinifaciens was isolated from the colon of swine, and first described as small spirochete by Harris et al. in 1972 . In 1974 it was published that strain 6091T belonged to a group of harmless inhabitants of the intestine of healthy pigs and had no pathogenic potential . No further isolates have been described and strain 6091T was designated the type strain of the new species T. succinifaciens in 1979 . Here we present a summary classification and a set of features for T. succinifaciens 6091T, together with the description of the complete genomic sequencing and annotation. A representative genomic 16S rRNA sequence of T. succinifaciens was compared using NCBI BLAST  under default settings (e.g., considering only the high-scoring segment pairs (HSPs) from the best 250 hits) with the most recent release of the Greengenes database  and the relative frequencies of taxa and keywords (reduced to their stem ) were determined, weighted by BLAST scores. The most frequently occurring genera were Treponema (97.5%) and Spirochaeta (2.5%) (32 hits in total). Regarding the single hit to sequences from members of the species, the average identity within HSPs was 97.7%, whereas the average coverage by HSPs was 96.1%. Regarding the 14 hits to sequences from other members of the genus, the average identity within HSPs was 89.2%, whereas the average coverage by HSPs was 54.1%. 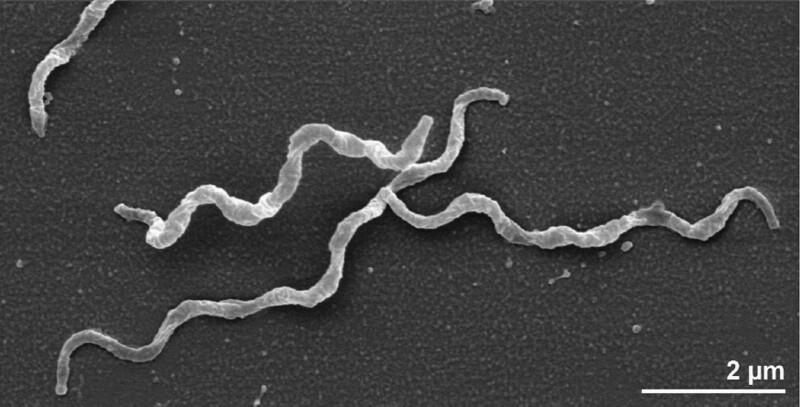 Among all other species, the one yielding the highest score was Treponema socranskii (AY369254), which corresponded to an identity of 89.8% and an HSP coverage of 55.7%. (Note that the Greengenes database uses the INSDC (= EMBL/NCBI/DDBJ) annotation, which is not an authoritative source for nomenclature or classification.) The highest-scoring environmental sequence was EU462604 (‘Evolution mammals and their gut microbes Sumatran orangutan feces clone orang2 aai66a03’), which showed an identity of 99.6% and an HSP coverage of 91.6%. The most frequently occurring keywords within the labels of environmental samples which yielded hits were ‘gut’ (11.2%), ‘evolut, fece, mammal, microb’ (8.2%), ‘baboon, hamadrya’ (6.3%), ‘termit’ (5.1%) and ‘homogen’ (2.2%) (218 hits in total). The most frequently occurring keywords within the labels of environmental samples which yielded hits of a higher score than the highest scoring species were ‘gut’ (12.1%), ‘evolut, fece, mammal, microb’ (11.5%), ‘baboon, hamadrya’ (9.9%), ‘rumen’ (1.3%) and ‘termit’ (1.1%) (77 hits in total). These keywords fit to the ecological and physiological properties reported for strain 6091T in the original description . 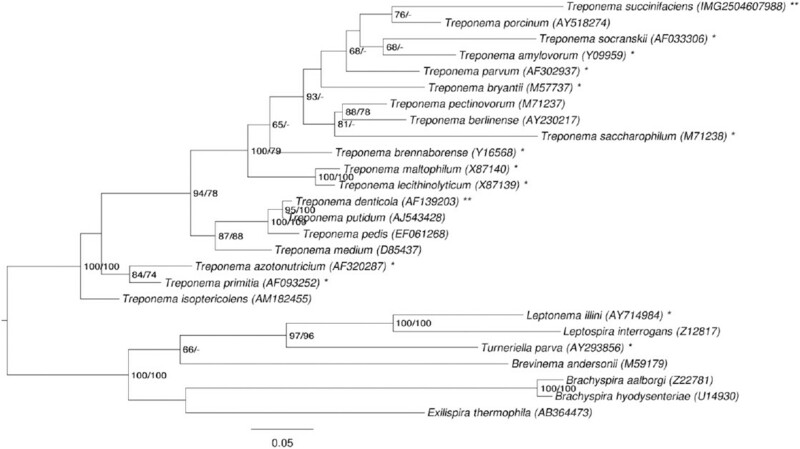 Figure 1 shows the phylogenetic neighborhood of T. succinifaciens in a 16S rRNA based tree. The sequences of the four 16S rRNA gene copies in the genome differ from each other by up to seven nucleotides, and differ by up to 14 nucleotides from the previously published 16S rRNA sequence (M57738), which contains 26 ambiguous base calls. Phylogenetic tree highlighting the position of T. succinifaciens relative to the type strains of the other species within the phylum ‘Spirochaetes’. The tree was inferred from 1,350 aligned characters [9,10] of the 16S rRNA gene sequence under the maximum likelihood (ML) criterion . Rooting was done initially using the midpoint method  and then checked for its agreement with the current classification (Table 1). The branches are scaled in terms of the expected number of substitutions per site. Numbers adjacent to the branches are support values from 1,000 ML bootstrap replicates  (left) and from 1,000 maximum parsimony bootstrap replicates  (right) if larger than 60%. Lineages with type strain genome sequencing projects registered in GOLD  are marked with one asterisk, those also listed as ‘Complete and Published’ (as well as the target genome) with two asterisks . The cells of T. succinifaciens are of helical shape (0.3 × 4–8 µm) and usually exhibit irregular coiling (Figure 2). Cells are up to 16 µm long and also chains of cells may occur in culture . T. succinifaciens is a Gram-negative and non spore-forming bacterium (Table 1). The organism displays temperature-dependent motility of translational, rotary and flexing movements; at 23–25°C no translational movement can be observed and rotation is slow, whereas at 37°C cells are very mobile (average velocity: 15µm/s) . T. succinifaciens harbors two periplasmic fibrils inserted near each end of the cell . The genome of T. succinifaciens contains 63 genes involved in motility (see below). The organism is a strictly anaerobic chemoorganotroph . T. succinifaciens requires rumen fluid in media for good growth, replacement with a mixture of short-chain fatty acids leads to reduced growth yields . The temperature range for growth is between 22°C and 43°C, with an optimum between 35°C and 39°C . The organism is catalase-negative and does not grow in the presence of 6.5% NaCl . T. succinifaciens requires CO2 for growth and is able to utilize arabinose, xylose, glucose, mannose, galactose, maltose, lactose, cellobiose, dextrin and starch for fermentation. Sugar alcohols, amino acids and other organic acids cannot be fermented by the organism . Major fermentation products of glucose are acetate, formate, succinate and lactate, whereas pyruvate, acetoin and 2,3-butanediol are formed in minor amounts . Assays of enzymatic activities showed that T. succinifaciens dissimilates glucose via the Embden-Meyerhof pathway . It was shown that pyruvate is metabolized through the activity of pyruvate formate lyase to yield acetyl-coenzyme A and formate, which is in contrast to other spirochetes that degrade pyruvate to acetyl-coenzyme A, CO2 and H2 . Furthermore, T. succinifaciens is capable of CO2 fixation for the production of succinate . Also, the organism possesses enzymatic activity of adenine deaminase, phosphoribosyltransferase (for adenine, guanine and hypoxanthine), nucleotidase (for AMP, IMP and GMP), nucleoside phosphorylase (for adenosine, guanosine and inosine) and nucleoside hydrolase (for inosine and guanosine) . Whether these activities are important for the survival of T. succinifaciens under nutrient deprivation or for adaptation to environmental stress is still unclear. An outer membrane-associated serine protease, which was found in several pathogenic spirochetes and also in T. succinifaciens, might be involved in the survival within the intestine, however, a role in pathogenesis can so far not be excluded . T. succinifaciens is susceptible to penicillin G (4 units/ml), cephalotin (4 µg/ml) and chloramphenicol (4 µg/ml). Growth of the organism is not impaired by erythromycin (4 µg/ml), oxytetracycline (4 µg/ml), polymyxin B (40 units/ml), rifampin (4 µg/ml), streptomycin (4 µg/ml), tetracycline (4 µg/ml) or vancomycin (4 µg/ml) . Classification and general features of T. succinifaciens 6091T according to the MIGS recommendations  and the NamesforLife database . Evidence codes - IDA: Inferred from Direct Assay (first time in publication); TAS: Traceable Author Statement (i.e., a direct report exists in the literature); NAS: Non-traceable Author Statement (i.e., not directly observed for the living, isolated sample, but based on a generally accepted property for the species, or anecdotal evidence). These evidence codes are from of the Gene Ontology project . If the evidence code is IDA, the property was directly observed by one of the authors or an expert mentioned in the acknowledgements. No chemotaxonomic information is currently available for T. succinifaciens. T. succinifaciens strain 6091T, DSM 2489, was grown anaerobically in DSMZ medium 275 (Treponema succinifaciens medium)  at 37°C. DNA was isolated from 0.5–1 g of cell paste using MasterPure Gram-positive DNA purification kit (Epicentre MGP04100) following the standard protocol as recommended by the manufacturer with modification st/DL for cell lysis as described in Wu et al. 2009 . DNA is available through the DNA Bank Network . The genome was sequenced using a combination of Illumina and 454 sequencing platforms. All general aspects of library construction and sequencing can be found at the JGI website . Pyrosequencing reads were assembled using the Newbler assembler (Roche). The initial Newbler assembly consisting of 134 contigs in two scaffolds was converted into a phrap assembly  by making fake reads from the consensus, to collect the read pairs in the 454 paired end library. Illumina sequencing data (3,531 Mb) was assembled with Velvet  and the consensus sequences were shredded into 1.5 kb overlapped fake reads and assembled together with the 454 data. The 454 draft assembly was based on 136.1 Mb 454 draft data and all of the 454 paired end data. Newbler parameters are -consed -a 50 -l 350 -g -m -ml 20. The Phred/Phrap/Consed software package  was used for sequence assembly and quality assessment in the subsequent finishing process. After the shotgun stage, reads were assembled with parallel phrap (High Performance Software, LLC). Possible mis-assemblies were corrected using gapResolution , Dupfinisher  or sequencing cloned bridging PCR fragments with subcloning. Gaps between contigs were closed by editing in Consed , by PCR and by Bubble PCR primer walks (J.-F. Chang, unpublished). A total of 305 additional reactions were necessary to close gaps and to raise the quality of the finished sequence. Illumina reads were also used to correct potential base errors and increase consensus quality using a software Polisher developed at JGI . The error rate of the completed genome sequence is less than 1 in 100,000. Together, the combination of the Illumina and 454 sequencing platforms provided 1,007.3 × coverage of the genome. The final assembly contained 486,725 pyrosequence and 36,577,056 Illumina reads. The genome consists of a 2,731,853 bp long chromosome and a 165.572 bp long plasmid both with a G+C content of 39.1% (Table 3, Figure 3 and Figure 4). Of the 2,786 genes predicted, 2,723 were protein-coding genes, and 63 RNAs; 115 pseudogenes were also identified. The majority of the protein-coding genes (57.8%) were assigned a putative function while the remaining ones were annotated as hypothetical proteins. The distribution of genes into COGs functional categories is presented in Table 4. 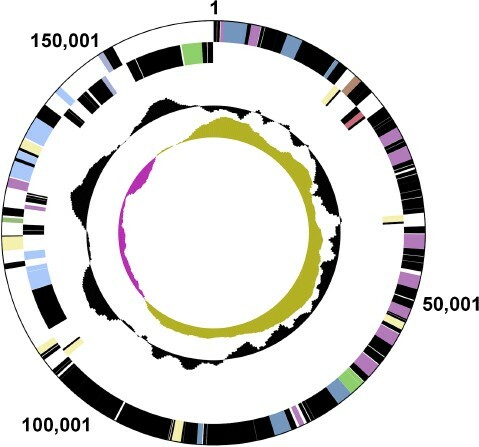 Graphical map of the chromosome (not drawn to scale with plasmid in Figure 4). From bottom to top: Genes on forward strand (color by COG categories), Genes on reverse strand (color by COG categories), RNA genes (tRNAs green, rRNAs red, other RNAs black), GC content, GC skew. 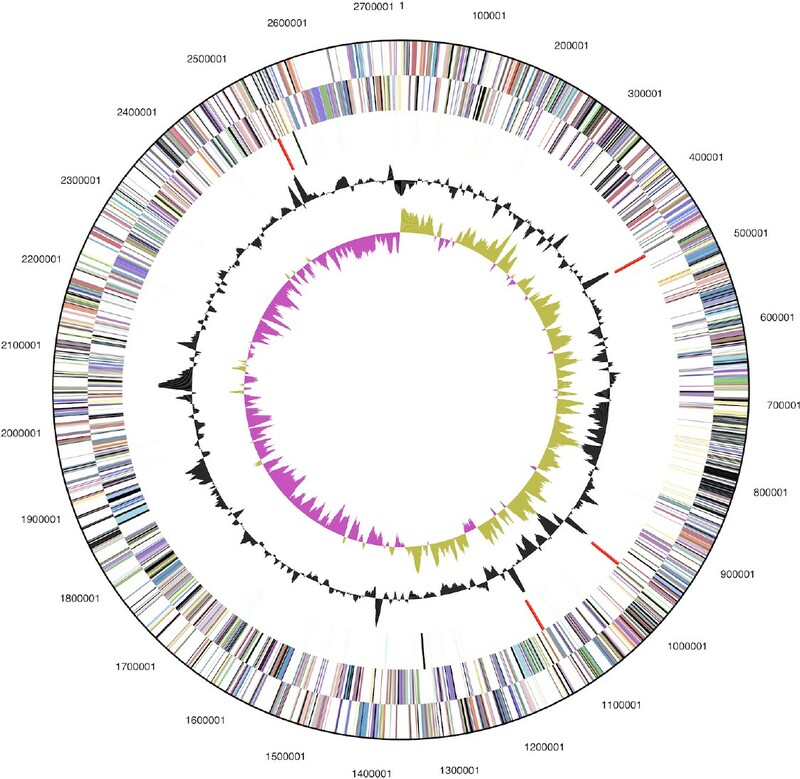 Graphical map of the plasmid (not drawn to scale with chromosome in Figure 3). From bottom to top: Genes on forward strand (color by COG categories), Genes on reverse strand (color by COG categories), RNA genes (tRNAs green, rRNAs red, other RNAs black), GC content, GC skew. We would like to gratefully acknowledge the help of Sabine Welnitz (DSMZ) for growing T. succinifaciens cultures. This work was performed under the auspices of the US Department of Energy Office of Science, Biological and Environmental Research Program, and by the University of California, Lawrence Berkeley National Laboratory under contract No. DE-AC02-05CH11231, Lawrence Livermore National Laboratory under Contract No. DE-AC52-07NA27344, and Los Alamos National Laboratory under contract No. DE-AC02-06NA25396, UT-Battelle and Oak Ridge National Laboratory under contract DE-AC05-00OR22725, as well as German Research Foundation (DFG) INST 599/1-2. Ludwig W, Euzeby J, Whitman WG. Draft taxonomic outline of the Bacteroidetes, Planctomycetes, Chlamydiae, Spirochaetes, Fibrobacteres, Fusobacteria, Acidobacteria, Verrucomicrobia, Dictyoglomi, and Gemmatimonadetes. http://www.bergeys.org/outlines/Bergeys_Vol_4_Outline.pdf. Taxonomic Outline 2008.